You will be delighted with the best hotels near Las Vegas Convention Center which are located within one mile and ranging from budget to value to mid-range to luxury. Whether you are seeking a traditional room or a suite experience there is something that will fit into everyone’s budget. 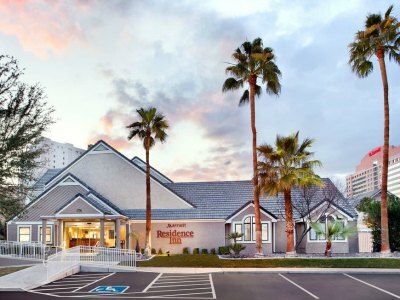 A great selection for a mid-range all-suite hotel near Las Vegas Convention Center that is perfect for all types of travelers including families is the Residence Inn Las Vegas Convention Center by Marriott. 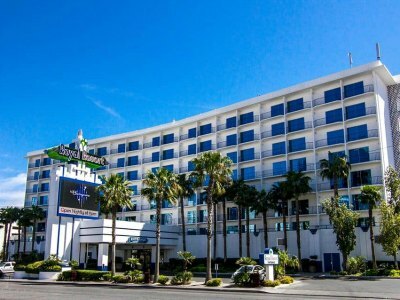 Located less than one mile from the Strip across the street from the Las Vegas Convention Center, the Residence Inn Las Vegas Convention Center is 1-block from the Las Vegas Las Vegas Monorail which makes stops at several hotels and casinos along the Strip such as the MGM Grand. The Residence Inn Las Vegas Convention Center by Marriott has a modern two story architectural design with 197 suites that feature a contemporary interior. Studios are sized at 450 square feet with an open floorplan that includes a sofa sleeper and a full kitchen. Two-bedroom loft style suites have 575 square feet on two-levels of living space, a separate living room and a full kitchen. The Residence Inn Las Vegas Convention Center by Marriott is an easy walk to the Las Vegas Las Vegas Monorail which will take you to the Strip where you will find plenty of attractions and you can walk to Vegas Indoor Skydiving as well as the Fashion Show Mall. The Residence Inn Las Vegas Convention Center by Marriott has a freshwater swimming pool but does not offer a fitness center. Dining onsite includes a complimentary breakfast daily and there is grocery service to help with a leisurely home cooked meal. Offsite dining choices within walking distance include Piero’s Italian Cuisine, Sinatra and the Steak House. Nightlife could include a walk to Circus Circus Hotel for the Beatles Love Cirque du Soleil performance, dancing at Intrigue Nightclub or visit one of the casinos along the Strip via the Las Vegas Las Vegas Monorail. The Courtyard by Marriott Las Vegas Convention Center is a quality non-gaming value hotel near Las Vegas Convention Center that is perfect for conventioneers and families. Located directly across the street from the Las Vegas Convention Center and less than one mile east of the Strip, the Courtyard by Marriott Las Vegas Convention Center is 5-minutes from the Las Vegas Las Vegas Monorail which can help when you are exploring the Strip. The Courtyard by Marriott Las Vegas Convention Center has a modern three floor architectural style with 137 rooms and suites which offer a fresh contemporary decor. Rooms are sized between 300 to 344 square feet with a choice of bedding, floor to ceiling windows and some rooms offer a private balcony. One-bedroom suites have 450 square feet with a separate living room, floor to ceiling windows and a private balcony. The Courtyard by Marriott Las Vegas Convention Center allows for easy access to the Strip via the Las Vegas Las Vegas Monorail which makes several stops and you can walk to Wynn Las Vegas within 20-minute for high-end shopping. The Courtyard by Marriott Las Vegas Convention Center has a freshwater swimming pool with a sundeck and barbeque area as well as a fitness center. Dining onsite includes the Bistro for breakfast and dinner service. You will find plenty of options within walking distance such as ENVY the Steakhouse, La Cave and Andrea’s serves Asian. Nightlife requires a walk to the Wynn Las Vegas for Le Reve-The Dream or you can visit one of the many live performances on the Strip. When you are seeking a value non-gaming all-suite hotel near Las Vegas Convention Center then you should try the Springhill Suites by Marriott Las Vegas Convention Center. Located within one-half mile to the Las Vegas Convention Center and less than one mile east of the Strip, the Springhill Suites by Marriott Las Vegas Convention Center are 2-blocks from the Las Vegas Las Vegas Monorail which makes visiting the Strip easy and exciting. The Springhill Suites by Marriott Las Vegas Convention Center has a modern twenty four story architectural design with 299 suites that boast a contemporary interior. Suites are 425 square feet with a choice of bedding, a living room separating by a privacy wall that contains a trundle bed, a small kitchenette (microwave and refrigerator) and views of the Strip are available. The Springhill Suites by Marriott Las Vegas Convention Center is a 20-mintue walk to the northern end of the Strip where you will find plenty of attractions such as the Strip Gun Club, Vegas Indoor Skydiving and casino action. The Springhill Suites by Marriott Las Vegas Convention Center sports a rooftop freshwater swimming pool with a sundeck that offers views of the Strip and a fitness center onsite. Dining onsite includes a complimentary breakfast daily as well as lunch and dinner service at Palettes Gallery and Bistro. Offsite dining choices within a quick walk include La Salsa Fresh Mexican Grill, the Golden Steer Steak House and Benihana. Nightlife requires a short walk to the Westgate Las Vegas Resort where you will find plenty of live performances and a lively casino or you can venture to the Strip where you will find a plethora of entertainment venues. Address: 3000 S. Paradise Rd. 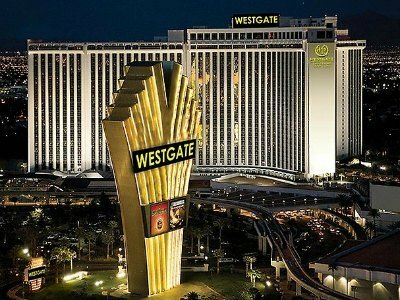 When you are looking for a mid-range hotel near Las Vegas Convention Center that boasts plenty of amenities onsite and is great for all types of travelers then the Westgate Las Vegas Resort and Casino is a superb choice. Located one mile east of the Strip and less than one mile from the Las Vegas Convention Center, the Westgate Las Vegas Resort and Casino is situated on 64-acres making this the largest off the Strip property and is complimented with a direct stop by Las Vegas Las Vegas Monorail. The Westgate Las Vegas Resort and Casino has a modern thirty story architectural design with 3,174 rooms and suites that feature a contemporary interior. All rooms and suites have a view of the Strip or the Las Vegas Country Club. Premium rooms are 400 square feet with a choice of bedding and Signature rooms offer a similar size with upgraded interiors (concierge level rooms are available). Studios have 400 square feet with a wet bar and a small kitchenette (microwave and refrigerator). One-bedroom Villas are sized at 900 square feet with a separate living that contains a sofa sleeper and a separate dining area. One-bedroom Deluxe suites have a variety of floorplans ranging in size from 975 to 1,150 square feet with a wet bar, choice of bedding as well as a separate living room and Luxury one-bedroom suites have 1,500 square feet with a wet bar, floor to ceiling windows as well as a separate living room. The Westgate Las Vegas Resort and Casino has a Las Vegas Las Vegas Monorail stop at the front door which allows for easy access to the Strip where you will find places like the Fashion Show Mall, the thrill rides at the Stratosphere and the Las Vegas Country Club is nearby for golfers. The Westgate Las Vegas Resort and Casino boasts lots of onsite amenities that begins with a rooftop freshwater swimming pool with a sundeck that offers poolside service, a fitness center, tennis courts, shopping boutiques and a full service spa. Dining at the hotel includes ten restaurants that range from Benihana to the Edge Steakhouse to Fresco Italian to Sid’s Cafe and there is a Fresh Buffet dining option. Entertainment and nightlife is plentiful onsite with a lively casino floor, three bars and numerous live performances that include Vinnie Favorito, Sexxy and Purple Reign, The Prince Tribute Show. 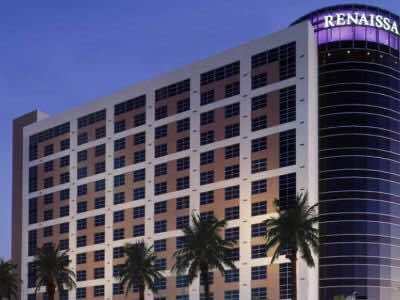 If you are seeking an upper-mid-range hotel near Las Vegas Convention Center that is perfect for conventioneers and business travelers then the Renaissance Las Vegas Hotel is a perfect selection. Located adjacent to the Las Vegas Convention Center, the Renaissance Las Vegas Hotel is a non-gaming property which is situated in front of the Las Vegas Las Vegas Monorail which will take you to the middle of the Strip in minutes. The Renaissance Las Vegas Hotel has a sleek modern fifteen floor architectural style with 548 rooms and suites which boast a sleek contemporary decor. Standard Deluxe rooms have 350 square feet with a choice of bedding and views of the Strip are available. Club level rooms are similar in size on a higher floor with a better view and upgraded amenities like access to private lounge where you can enjoy a complimentary breakfast and a nightly reception. All suites include access to club level amenities. The Exhibitor suite is sized at 726 square feet with an open floorplan that includes a Murphy bed, 1.5-bathrooms, a kitchenette and views of the Strip. One-bedroom Deluxe suites are 859 square feet with a separate living room, 1.5-bathrooms and views of the Strip. One-bedroom VIP suites have 1,165 square feet with a separate living room, 1.5-bathrooms, a kitchenette, dining area, a wet bar and views of the Strip. The one-bedroom Presidential suite has 1,700 square feet with a separate living room, 1.5-bathrooms, dining room, butler access, a kitchenette, a wet bar and views of the Strip. The Renaissance Las Vegas Hotel allows for easy access to the Strip via the Las Vegas Las Vegas Monorail which has a stop directly at the property and Las Vegas Convention Center. You are within a quick ride to the Grand Canal Shoppes at the Venetian, Fashion Show Mall and Madame Tussauds. The Renaissance Las Vegas Hotel has a small freshwater swimming pool with a small sun terrace and a large fitness center that overlooks the pool area. Dining onsite includes fine dining at ENVY the Steakhouse, casual dining at Grill 55 and there are quick bites at Ego Cafe. Offsite dining selections within a short walk include Firefly Tapas Kitchen and Bar, Piero’s Italian Cuisine and the Country Club. Nightlife starts with the Strip where you will find several attractions like the Mirage Volcano, the Bellagio Fountains and numerous entertainment venues. 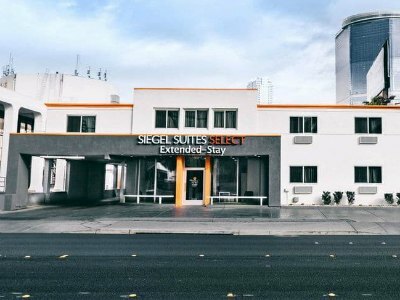 If you want to find a value hotel near Las Vegas Convention Center that is ideal for long term stays and is close to the Strip then try the Siegel Suites Select Convention Center. Located one-half mile east of the Strip within one mile of the Las Vegas Conventions Center, the Siegel Suites Select Convention Center is a non-gaming property that is situated near the Riviera Hotel and the Wynn Las Vegas. The Siegel Suites Select Convention Center has a modern two story architectural design with 100 all-suite accommodations that have recently been renovated and have a contemporary interior. Studios are 340 square feet with a choice of bedding and a small kitchenette (microwave and refrigerator). Larger one-bedroom king suites have 550 square feet with a separate living room and full kitchen. The Siegel Suites Select Convention Center is close to several nearby attractions including Vegas Indoor Skydiving, Slots-A-Fun Casino and the Las Vegas Monorail is short walk. The Siegel Suites Select Convention Center has a freshwater swimming pool but does not offer a fitness center. There is not a restaurant onsite but there is a plethora of dining choices within walking distance includes Tacos el Gordo, Piero’s Italian Cuisine and RA Sushi Bar Restaurant. Nightlife within walking distance includes Peppermill’s Fireside Lounge, XS Nightclub and the Riviera Comedy Club for laughs. 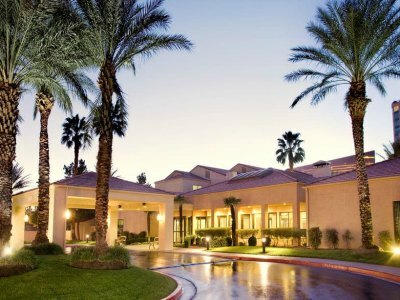 When you are searching for a quiet value hotel near Las Vegas Convention Center which is great for on the go travelers including families, then the Royal Resort is a perfect choice. Located one-half mile east of the Strip within a 10-minute walk to the Las Vegas Convention Center, the Royal Resort is a non-gambling property that is directly behind the Encore Wynn Las Vegas. The Royal Resort has a modern eight floor architectural style with 191 rooms and suites that have a contemporary decor. Standard rooms are 300 square feet with a choice of bedding and Superior rooms have 350 square feet with a murphy bed, small kitchenette (microwave and refrigerator) as well as a private balcony. One-bedroom Executive suites are sized at 700 square feet with a separate living room that has a sofa sleeper, a small kitchenette and a private balcony. 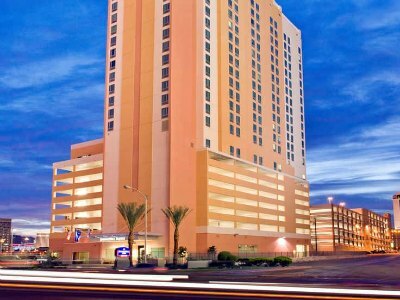 The Royal Resort boasts a great off-the-Strip spot with easy walking access to the Las Vegas Monorail, the Fashion Show Mall for shopping and the Adventuredome at Circus Circus. The Royal Resort has a freshwater swimming pool and fitness center onsite. Dining at the Royal Resort includes the Barrymore Restaurant for all three meals and you will find plenty of restaurants within walking distance that include Sinatra, the Capital Grille and Maggiano’s. Nightlife includes one of the numerous shows at the Encore Wynn and Wynn Las Vegas as well as a cold libation at the onsite bar at the Barrymore or dancing at Intrigue. 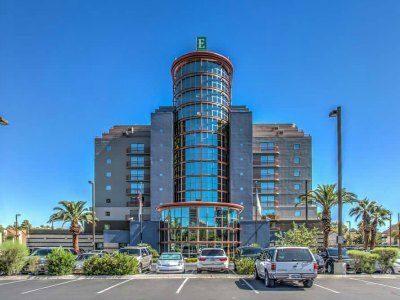 If you want to find a mid-range hotel near Las Vegas Convention Center that is ideal for all types of travelers who want to be close to the Strip then the Embassy Suites by Hilton Convention Center Las Vegas is a great option. Located one-half mile east of the Strip within a 10-minute walk to the Las Vegas Convention Center, the Embassy Suites by Hilton Convention Center Las Vegas is situated in a quiet neighborhood that allows for easy access to many of the attractions and the property offers a free shuttle service. The Embassy Suites by Hilton Convention Center Las Vegas has a modern eleven story architectural design with 268 rooms and suites which were renovated in 2017 with a fresh contemporary interior. All rooms and suites are furnished with a small kitchenette which includes a microwave and refrigerator. One-bedroom suites have 450 square feet with a choice of bedding, a separate living room and some units offer a private balcony. Two-bedroom Executive suites are larger with options such as a conference room, a separate living room and a choice of bedding. The Embassy Suites by Hilton Convention Center Las Vegas is short distance to the Strip and the free shuttle service will drop you off at the Las Vegas Convention Center, the Fashion Show Mall, a Las Vegas Monorail stop and the Strip. The property does not have a casino onsite but offers an indoor swimming pool and a fitness center. Dining includes a complimentary breakfast daily and the Fountain Grille is open for lunch as well as dinner. Offsite dining options within walking distance include the Firefly Tapas Kitchen and Bar, the Country Club and La Cave. Nightlife is limited to a nightly manager’s reception with free drinks as well as hot appetizers or you can walk to the Fun Hog Ranch and the Strip is always a good selection. 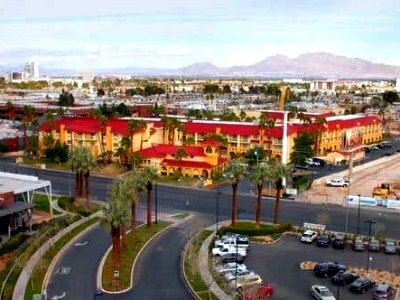 If you are looking for a value hotel near Las Vegas Convention Center with lots of family friendly amenities onsite then the Circus Circus Hotel, Casino and Theme Park is a super choice. Located within a 10-minute walk to the Las Vegas Convention Center along the northern section of the Strip, Circus Circus Hotel, Casino and Theme Park has been a mainstay on the Strip for decades featuring a wide variety of entertainment for children such as circus performances on an hourly basis. The Circus Circus Hotel, Casino and Theme Park has a modern thirty two floor architectural style with several buildings that contain 3,773 rooms as well as suites which were renovated in 2012 and sport a contemporary decor. Rooms at the Manor Motor Lodge and the Skyrise Tower are 351 square feet with a choice of bedding. The Casino and West Tower have rooms at 364 square feet with a choice of bedding and there are Casino Tower Large rooms with 434 square feet of living space. There are also a number of suites that range from one-bedroom to parlor suites to multiple levels to roman tub suites. If you are traveling by RV you will find a trailer park with hookups at the Circus Circus Hotel, Casino and Theme Park. 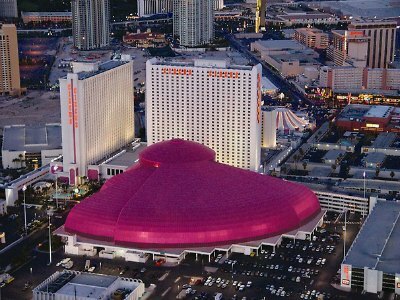 The Circus Circus Hotel, Casino and Theme Park are within a 5-minute drive to many attractions such as Dig This, Battlefield Vegas and shopping at the Fashion Show Mall. The Circus Circus Hotel, Casino and Theme Park is packed with entertainment for families that range from circus performances to a waterpark with four waterslides to the 5-acre Adventuredome indoor theme park complete with a rollercoaster and twenty six thrill rides to an authentic midway carnival game experience. Circus Circus Hotel, Casino and Theme Park have two freshwater swimming pools and a fitness center onsite. Dining onsite includes Vince Neil’s, the Steak House, Westside Deli, the Blue Iguana Authentic Mexican Cuisine, Circus Buffet, Pizzeria and a small food court with quick bites. Entertainment is all around at Circus Circus Hotel, Casino and Theme Park which includes the Beatles Love by Cirque Du Soleil. Nightlife can include a trip to the casino or a drink at Peppermill’s Fireside Lounge or the Rivera Comedy Club. When you are searching for a trendy hotel near Las Vegas Convention Center that caters to a younger crowd with a lively atmosphere then you should stay at the W Las Vegas. Located on the northern portion of the Strip within one mile to the Las Vegas Convention Center, the W Las Vegas is situated within an easy walk to the Las Vegas Monorail and offers guests additional amenities at the SLS Las Vegas next door. The W Las Vegas has a modern twenty six story architectural design with 289 rooms and suites that boast a European urban chic interior. Wonderful, Spectacular and Fabulous rooms are sized between 322 to 490 square feet with a variety of bedding choices and banquette sofas in the sitting area. Marvelous Studio suites have between 632 to 728 square feet with an open floorplan that has a living area. One-bedroom Mega and WOW suites range in size from 955 to 1,267 square feet with a separate living room, floor to ceiling mirrors, a wet bar and a dining area. The two-bedroom Extreme WOW suite has 2,382 square feet with a separate living room that features a grand piano, dining area, a kitchenette and two balconies. The W Las Vegas is close to several attractions such as Vegas Indoor Skydiving, the thrills ride at the Stratosphere as well as shopping at the Jewelry and Minerals of Las Vegas. 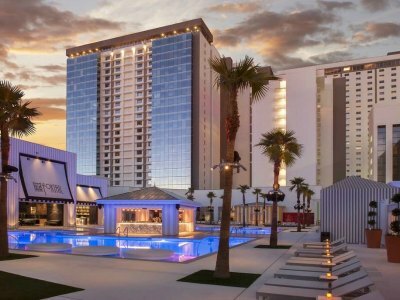 The W Las Vegas has two lively freshwater swimming pools including the rooftop adults-only European style WET pool as well as the Lux pool and you also have access to the Foxtail pool at the SLS Las Vegas. The property has a fitness center, shopping boutiques and a full service spa. Dining onsite requires a short walk to the adjacent SLS Las Vegas where you will find Umami Burger, Beer Garden and Sports Book, Katsuya, Cleo, Northside Cafe and Chinese Kitchen, the PERQ, 800 Degrees Neapolitan Pizzeria and Bazaar Meat by Jose Andres. Entertainment includes the Sayer Club and the Foundry as well as the W Living Room which is ideal for drinks. 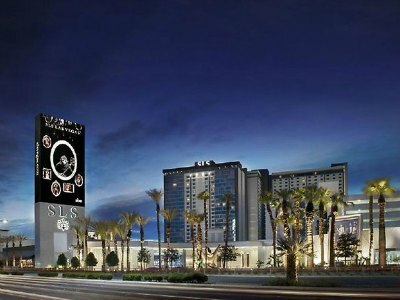 When you are seeking an upper-mid-range hotel near Las Vegas Convention Center that has a lively atmosphere and attracts younger adults as well as some families then the SLS Las Vegas is an ideal selection. Located within one mile of the Las Vegas Convention Center on the northern end of the Strip, the SLS Las Vegas is housed in the former Sands Hotel and there is a Las Vegas Monorail stop right in front. The SLS Las Vegas is composed of two modern twenty six floor buildings that contain 1,327 rooms as well as suites that have been renovated in 2014 and feature a contemporary urban chic decor. Rooms in the World Tower are 360 square feet with a choice of bedding and those in the Story Tower are 325 square feet with a choice of bedding as well as a mirror on the ceiling. One-bedroom World Signature and World suites range in size from 540 to 730 square feet with a separate living room that includes a wet bar. One-bedroom Story Signature and Story suites are between 440 to 675 square feet with a separate living room that includes a wet bar. The one-bedroom World Clyde suite has 1,075 square feet with a separate living room, a dining area and 1.5-bathrooms. The two-bedroom Story Penthouse has over 3,300 square feet of indoor/outdoor living space with a separate living room, dining area, floor to ceiling mirrors, 1.5-bathrooms, a fireplace and two rooftop patios. The SLS Las Vegas is within walking distance to Bonanza Gifts, SkyJump Las Vegas and the Burlesque Hall of Fame. The SLS Las Vegas has a renovated casino area that attracts a younger crowd and there are numerous shopping boutiques onsite. There are two freshwater swimming pools that include the Foxtail Club and the adults-only Retro Pool Lounge. The SLS Las Vegas also features Life/Beach Life on the weekends with live DJ’s and a party atmosphere. The property has a fitness center and a full service spa. Dining includes seven restaurants which are 800 Degrees Neapolitan Pizzeria, Umami Burger, Beer Garden and Sports Book, the Northside Cafe and Chinese Kitchen, Katsuya, Cleo as well as Bazaar Meat by Jose Andres. Entertainment is a big attraction at the SLS Las Vegas with live performances at the Sayers Club and the Foundry. Nightlife is lively with the Foxtail Club, the Monkey Bar and the Center Bar. Address: 3121 S. Las Vegas Blvd. 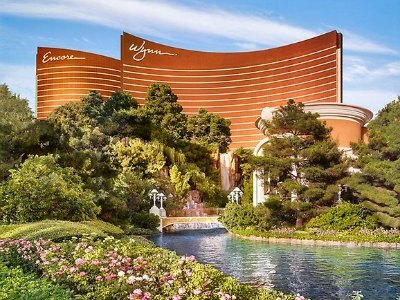 The Encore at Wynn Las Vegas is a superb luxury hotel near Las Vegas Convention Center which is packed with onsite amenities and is a good choice for all travelers. Located on the northern portion of the Strip within one mile of the Las Vegas Convention Center, the Encore Wynn Las Vegas is situated within the same complex as Wynn Las Vegas and shares some of the its sister property amenities. The Encore Wynn Las Vegas has a modern fifty story architectural design with 2,034 rooms and suites that offer a contemporary interior with Asian ascents. All rooms and suites have floor to ceiling windows that boast views of the pool, resort, golf course or the Strip. Resort and Panoramic rooms are 745 square feet with an open floorplan that includes a living area that has a sofa sleeper. Tower suites have 745 square feet with one-bedroom, a living room, upgraded amenities like complimentary continental breakfast and access to an exclusive Tower swimming pool. One-bedroom Parlor and Salon suites are sized between 1,408 to 2,261 square feet with a separate living room that has a dining area, 1.5-bathrooms, a wet bar, massage room and upgraded amenities. Two-bedroom Apartments have 3,475 square feet with a separate living room that has a dining area, butler’s pantry, massage room, 2.5-bathrooms and upgraded amenities. The three-bedroom Duplex are sized at 5,829 square feet on two-levels with a separate living room that offers a dining area, a wet bar, billiard room, massage room, 2-butler’s pantries, 3.5-bathrooms and upgraded amenities. The Encore Wynn Las Vegas has numerous designer boutiques onsite and is directly across from the Fashion Show Mall for shopping. You are a short taxi ride away from attractions like Battlefield Vegas, gondola rides at the Venetian and Madame Tussauds. There are two freshwater swimming pools including a European pool with a swim-up bar for adults-only. You have access to the 18-hole championship golf course at Wynn Las Vegas and there is a fitness center as well as a full service spa. Dining at the Encore Wynn Las Vegas includes ten casual dining choices and ten fine dining restaurants with food selections that range from Mexican to Gourmet to Italian to American to Asian. Entertainment is spectacular with performances such as Lake of Dreams and Le Reve-The Dream. Nightlife onsite includes the Encore Beach Club, Surrender and XS are great for clubbing. When you are looking for a luxury hotel near Las Vegas Convention Center that is perfect for families with lots of amenities onsite including a golf course then the Wynn Las Vegas is ideal. Located within a 15-minute walk to the Las Vegas Convention Center, the Wynn Las Vegas is situated directly across the street from the Fashion Show Mall along the Las Vegas Monorail route on the Strip. The Wynn Las Vegas has a modern fifty floor architectural style with 2,611 rooms and suites that boast a luxurious contemporary decor. All rooms and suites have floor to ceiling windows that offer views of the resort, golf course or Strip. Deluxe Resort rooms are 640 square feet with a choice of bedding (king bed rooms include a sofa sleeper). Tower suites are 640 square feet with a choice of bedding (king suites have a sofa sleeper), floor to ceiling windows and upgraded amenities. Executive suites are 933 square feet have an open floorplan that has a living area, floor to ceiling windows, his and hers bathrooms. The one-bedroom Parlor suite is 1,280 square feet with a separate living room, 1.5-bathrooms. The one-bedroom Salon suite has 1,817 square feet with a separate living room, massage room, 1.5-bathrooms, wet bar and dining area. Fairway Villas are one or two-bedrooms between 2,411 to 3,224 square feet with a separate living room, dining area, wet bar, massage room, 2.5-bathrooms and private balconies with views of the golf course. The Wynn Las Vegas is close to several attractions such as the Flamingo Wildlife Habitat as well as Vegas Indoor Skydiving. The Wynn Las Vegas has two freshwater swimming pools including a European style pool for adults-only and there is poolside service. Tower guests also have access to an exclusive pool, the Tower Bar and other upgraded amenities. The Wynn Las Vegas is packed with amenities including an 18-hole championship golf course which is the only course on the Strip, a fitness center, shopping boutiques and full service spa. Dining includes ten fine dining restaurants such as Wing Lei and ten casual dining restaurants like Allegro. Entertainment is plentiful within the Wynn Las Vegas with performances by artists such as Diana Ross, the Moody Blues and Le Reve-Dream is fascinating show. Nightlife includes several nightclubs onsite which include XS, Intrigue and Surrender. If you are seeking a mid-range boutique hotel near Las Vegas Convention Center that is superb for all types of travelers is the Lucky Dragon Las Vegas. Located within one mile to the Las Vegas Convention Center, the Lucky Dragon is situated one-half mile west of the Strip and is a 20-minute walk to the Fashion Show Mall. The Lucky Dragon Las Vegas has a modern ten story architectural design with 203 rooms and suites that sport a contemporary Asian interior. Rooms are sized between 351 to 500 square feet with a choice of bedding, floor to ceiling windows and views of the Strip or mountains. Junior suites have 498 square feet with an open floorplan that includes a sofa sleeper, floor to ceiling windows and views of the Strip. One-bedroom suites are 612 square feet with a separate living room, floor to ceiling windows and a view of the Strip. The Lucky Dragon Las Vegas has a unique Asian theme throughout the property highlighted by a glass dragon sculpture that is 2.5-stories high and weighs 1.25-tons. 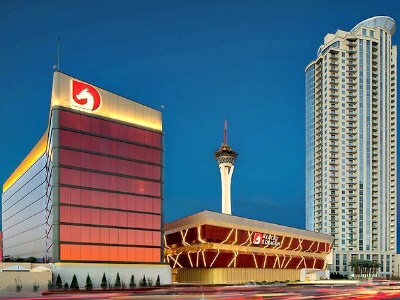 There are many attractions nearby the Lucky Dragon Las Vegas which include SkyJump Las Vegas, Counts Kustoms and the many thrill rides at the Stratosphere. The Lucky Dragon Las Vegas has a distinct Asia style casino with Pai Gow and Sic Bo for guests as well as an assortment of other standard table games and slot machines. 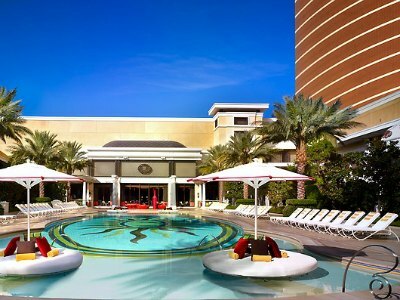 The Lucky Dragon Las Vegas has a freshwater swimming pool, a fitness center and full service spa onsite. Dining includes five Asian style restaurants that include the Pearl Ocean, Phoenix Phoenix, Cha Garden, Pack Dumpling Shop which is open 24/7 and Dragon Lane Alley. Offsite dining choices nearby include the Golden Steer Steak House, the Peppermill Restaurant and Fireside Lounge as well as Piero’s Italian Cuisine. Nightlife onsite includes the Atrium and Pagoda Bars or you can catch a show within walking distance like World’s Greatest Rock Show as well as MJ Live. When you are searching for a value hotel near Las Vegas Convention Center that is great for families and all types of travelers then the La Quinta Inn and Suites Las Vegas Airport North Convention is a superb choice. Located one mile east of the Strip, the La Quinta Inn and Suites Las Vegas Airport North Convention is situated within a 15-minute walk to the Las Vegas Convention Center or you can take advantage of the free shuttle service to the convention center. The La Quinta Inn and Suites Las Vegas Airport North Convention have a modern Spanish colonial three floor architectural design with 251 rooms and suites that feature a contemporary decor. All rooms and suites are furnished with a small kitchenette that includes a microwave and refrigerator. Rooms have 250 square feet with a choice of bedding and views of the surrounding area or courtyard. Executive king suites are sized at 300 square feet with an open floorplan that contains a sofa sleeper and views of the courtyard or surrounding area. One-bedroom suites are larger with a separate living room that has a sofa sleeper and views of the courtyard. The La Quinta Inn and Suites Las Vegas Airport North Convention are within walking distance to several major attractions including the National Atomic Testing Museum, the High Roller and the Fashion Show Mall for shopping. The La Quinta Inn and Suites Las Vegas Airport North Convention has a freshwater swimming pool that is surrounded by a nice courtyard and a fitness center onsite. Dining includes a complimentary breakfast daily and you will find numerous dining options within a close distance that includes Caribbean cuisine at Bahama Breeze, Imperial Tacos and Beer serves Mexican dishes and Marilyn’s Cafe. You can find nightlife nearby at the Motor City Cafe LV, the Havana Cigar Bar and numerous shows are within walking distance that include the Rat Pack is Back as well as Raiding the Rock Vault. Address: 3325 S. Las Vegas Blvd. If you are seeking a luxury all-suite hotel near Las Vegas Convention Center that is perfect for couples as well as families and has plenty of onsite amenities then the Palazzo Las Vegas is an ideal choice. 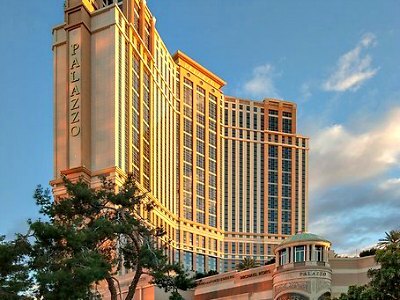 Located within one mile of the Las Vegas Convention Center, the Palazzo Las Vegas is situated along the Las Vegas Monorail route to the convention center directly on the Strip adjacent to its sister hotel the Venetian. The Palazzo Las Vegas has a modern fifty two story architectural design with Renaissance Revival ascents and contains 3,066 suites which feature a luxurious interior that sports Art Deco ascents. All suites have floor to ceiling windows that sport a view of the pool deck, Strip and surrounding mountains. Luxury and Bella suites are 720 square feet with an open floorplan that offers a choice of bedding and a sunken living room. Fortuna and Siena suites range in size from 940 to 1,280 square feet with a sunken living room. Lago suites are 1,943 square feet with one or two-bedrooms, separate living room with piano or billiard table and multiple bathrooms. Two-bedroom Penthouse suites have 3,204 square feet with a separate living room and multiple bathrooms. Presidential and Chairman suites have between 6,367 to 7,828 square feet with three or four-bedrooms, separate living room, multiple bathrooms and the Chairman suites have a terrace with private pool. The Palazzo Las Vegas has several attractions within the property that includes shopping at the Atrium and the Grand Canal Shoppes, Madame Tussauds, plenty of unique artwork throughout the hotel and you can take a gondola ride at the Venetian. You have access to ten freshwater swimming pools which feature specialty pools for families and three adults-only pools including the Tao Beach Club as well as the Aquatic Club. The Palazzo Las Vegas has other amenities onsite including a 105,000 square feet casino, a fitness club, a climbing wall and a full service spa. Dining at the Palazzo Las Vegas is plentiful with over 40 choices that range from casual dining at Canaletto to fine dining at Carnevino. Cuisine selections range from American to Italian to Gourmet to Mexican to Asian. Nightlife is perfect onsite with the Tao Night Club, the Biergarten at Lagasse’s Stadium and you can catch one of the five shows that range from the Eli and Mariano Comedy Show to the Human Nature: Jukebox.